Molecular clouds in interstellar space can sometimes produce natural masers (the radio wavelength analogs of lasers) that shine with bright, narrow beams of radiation. Regions of active star formation generate some of the most spectacular such masers—in one case radiating as much energy in a single spectral line as does our Sun in its entire visible spectrum. In these sources, the maser radiation comes from molecules like water or OH that are excited by collisions and the radiation environment around the young stars. 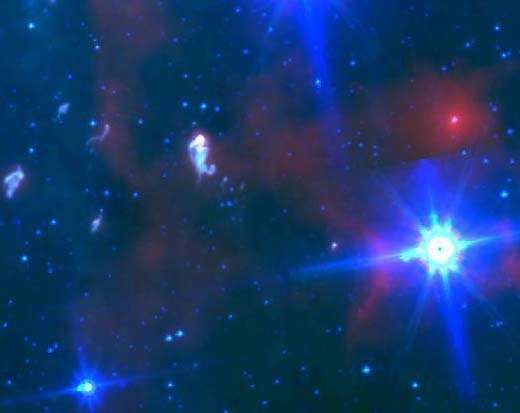 In 1989, maser emission from atoms of atomic hydrogen gas was discovered around the star MWC349, a source with a disk of ionized material that is seen edge-on and a bipolar outflow. The emission is extremely bright and varies in time, the result of sensitivity to changes in the detailed excitation processes. Subsequent observations over the decades have found numerous masing hydrogen lines around this star, allowing scientists to model the emitting region more carefully. MWC349 has two particularly mysterious features. The infrared 3-color image above of the region of star formation includes the mysterious maser star MWC349 (the very bright star at the right). New spectroscopic results find that the star is probably not physically associated with a nearby star whose age (assuming it was a binary companion) had been used to constrain the age of MWC349 itself. As a result, MWC349 might be a very young massive star. First, it is an almost unique example of a hydrogen maser source, Despite decades of searching for similar sources, only a few other examples have been found, and they are all much fainter and less dramatic. The second is that its age is not known: it has been suggested to be a very young star still approaching the main-sequence, or an evolved star well into its main-sequence evolution. The consensus so far—that it is old—comes from the fact that there is another star only a few arcseconds away from it and possibly a binary companion. That star is older, about five million years, and so the MWC349 itself must be that old as well. But the evidence is confusing, and the rare and unusual nature of the object makes its age classification an astronomical priority. CfA astronomers Howard Smith and Jessica Mink, together with four colleagues, used the TRES spectrograph of the 1.5-meter Tillinghast Reflector of the Fred L. Whipple Observatory and the Keck/HIRES spectrograph to measure carefully the velocities of the two stars from the wavelengths of their spectral lines. They find that the two differ by about thirty-five kilometers per second, making the binary companion scenario unlikely. The scientists conclude that probably the second star is just a coincidental alignment. The result reopens the possibility that MWC349 is a young, massive star in a region of active star formation.